This Rugged Leather farming guide is made to help you farm Rugged Leather. I decided to search for places with high density of mobs which I can skin and drop Rugged Leather. I traveled around Azeroth, and after a while I made a list of places. The recommended skinning skill for farming Rugged Leather is around 280. If you farm at these places with lower Skinning skill, you will get a lot of lower tier Leather until you reach 280. This is a level 60 raid instance, so only level 80+ players can farm here. 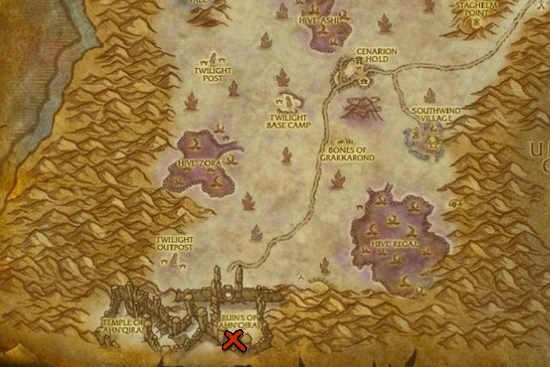 You can probably solo it at lower levels too, but I haven't tested it since I don't have a character at that level, and if you kill the mobs too slowly it's not really worth to farm here. It takes about 2-3 minutes to clear the first two room and you will get around 60-80 Rugged Leather. After you cleared the instance, run out, then you have to reset it by right clicking over your own portrait, and then click the "Reset Instance" button. This restarts the whole instance, and all mobs will be back. You can only do 10 instance runs in an hour, so you will get around 700 leathers in 20-30 minutes. Don't kill Kurinnax! You can't reset the trash mobs if you kill the boss. There are two other rooms where you can get Rugged Leather, but it's only worth to go there if you need more than 700 Leather, since you will hit the 10 instance / hour limit with clearing only the first two rooms. I marked the two other rooms with yellow lines. Don't kill any bosses! 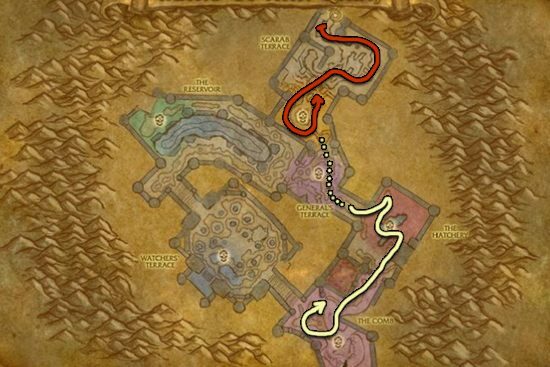 Blasted Lands is the best place to farm Rugged Leather if you can't farm at Onyxia's Lair. You will skin Ashmane Boars, and other various beasts like Snickerfang Hyena, Felhounds etc. These are my favorite places for Rugged Leather farming. Contact me if you have other great farming spots! Visit my Knothide Leather farming page when you have enough Rugged Leather!